As a vegetarian, I am ashamed to say that despite hearing about the Meat-Free Monday campaign, I have never really looked into it as I already felt that I was doing my bit by being meat-free seven days a week. 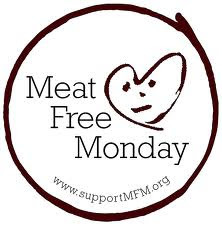 However my good friend and fellow vegetarian Marianne recently donned a T-Shirt and handed out leaflets next to a masquerading polar bear to raise awareness of the campaign, and so I thought I should find out what Meat-free Mondays are all about. The Meat Free Monday campaign is designed to reduce global CO2 emissions in order to slow the rate of climate change and protect the environment. It was launched by Sir Paul McCartney and his daughters Stella and Mary. Climate change could drive millions of the world’s species, including the polar bear to extinction. The group “Compassion in World Farming” has estimated that if the average UK household halved its consumption of meat, this would cut more emissions than if car use was cut in half. Cutting the use of dairy products would also help to reduce emissions and reduce climate change. My local town of St Albans may soon become the first Meat Free Monday local authority in the whole of the UK. A consultation has been started by the local council, suggesting that all publicly funded organizations in the city become meat-free on Mondays. This would mean that if approved, all hospitals, council buildings and school canteens would be a meat-free zone one day of the week. So why not consider having a meat free day yourself? With the price of meat rising each week, Meat-free Monday (or any other day) is good for your shopping bill, good for your health and also good for the environment. You can rally your local MP to become involved in the Meat-free Monday campaign through the website. I can report that the general public of St Albans is in general in favour of Meat Free Mondays. From the 30 or so people I personally questioned at the market on 16th April, most people thought it was a good idea and would be happy to try it. So far there have been over 700 responses to the questionnaire by St Albans residents, most of them positive. The results will be discussed at the next Council meeting on 12th May. Fingers crossed!